The SPORTident ActiveCard (SIAC) enables contactless timing, making it the ideal choice for trail running, mountain biking, orienteering races and other adventure sports. The ActiveCard registers the time and code number of an AIR+ compatible SPORTident Station in a proximity range of up to 3 meters and at a maximum passing speed of 40 km/h. The successful punch is indicated by both optical and acoustic feedback for the athlete. The ActiveCard is fully backwards-compatible with the SPORTident classic system: Direct punching works with all existing SPORTident Stations. Card readout and record data format are the same as for classic cards, making the ActiveCard compatible with all existing software solutions. The ActiveCard stores up to 128 punches and registers a direct punch in less than the tenth of a second. By normal use the battery life time is approximately four years, after that the battery can be replaced by SPORTident. 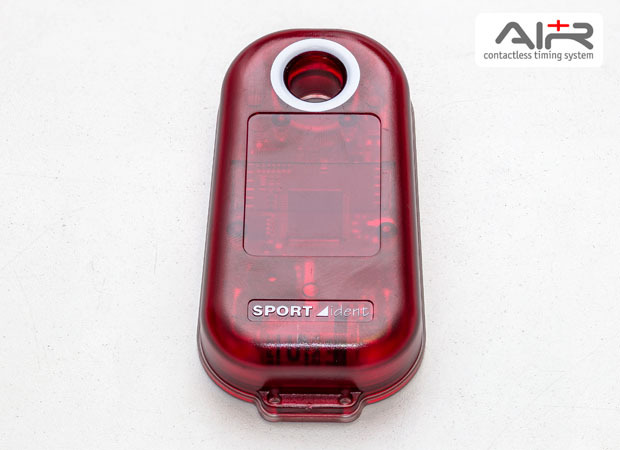 The SPORTident ActiveCard also includes a radio module which enables live data during the race, as well as radio readout of the card after the race. 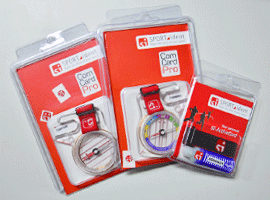 The SPORTident ComCard Pro is the next generation of the SPORTident ComCard made for sportive orienteering. 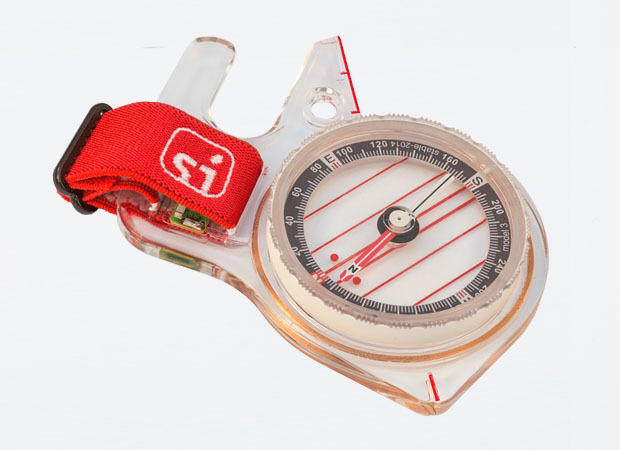 It combines the SI-Card10 and a high-quality compass in one single, beautiful device. Use the ComCard Pro to both navigate on the track and punch at the control stations. The ComCard Pro's patent-pending design guarantees zero deviation of the compass needle and at the same time offers the comfortable SPORTident punching experience that you have come to rely on. The ComCard Pro is available with a selection of four different Moscompass capsules to best meet athletes' orienteering style. Both left-handed and right-handed compass models are available. The SPORTident ComCard Up is a novel product for orienteering, combining SPORTident card and compass in one single, beautiful device. Use the ComCard Up to both navigate on the track and punch at the control stations. The ComCard Up's patent-pending design guarantees zero deviation of the compass needle and at the same time offers the comfortable SPORTident punching experience that you have come to rely on. The ComCard Up is equipped with a good, all-around Moscompass capsule with fast setting time and good stability. 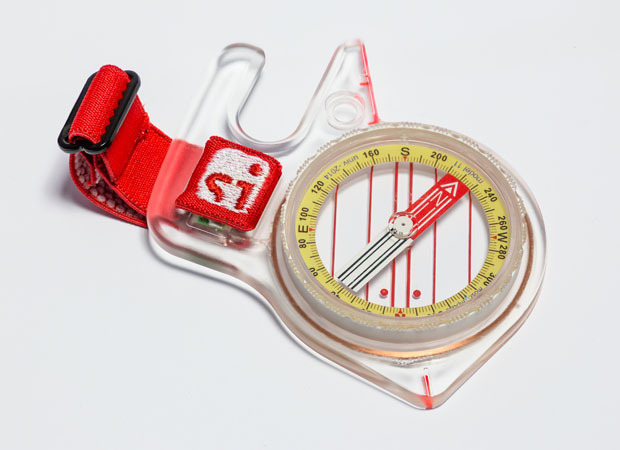 The capsule features a large needle and a full scale, making it ideal for the beginning and advanced orienteer. Both left-handed and right-handed compass models are available. SI-Cards10 belongs to the third generation of SI-Cards. SI-Cards10 register the data record in 60 ms. This fast data record speed is twice as fast as SI-Card8/9. Not only coming with high punching speed but also SI-Card10 features large memory size which is able to store up to 128 intermediate times. It makes the SI-Card10 the perfect choice for the ambitious runner. 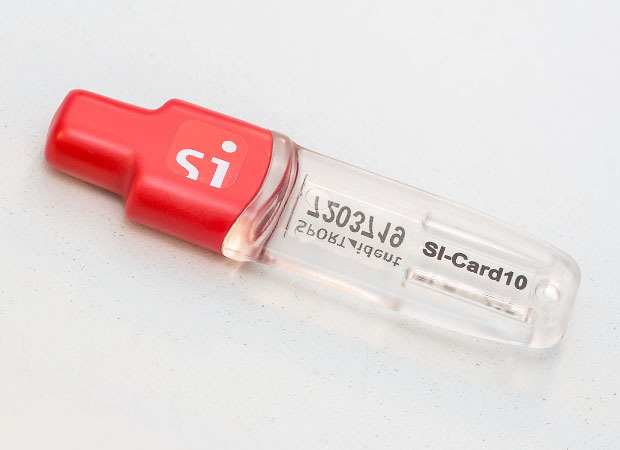 SI-Card10 comes in sundry-coloured tips and a transparent body. SI-Card9 belongs to the second generation of SI-Cards with a lot of new and exciting features to make outdoor sport more attractive. 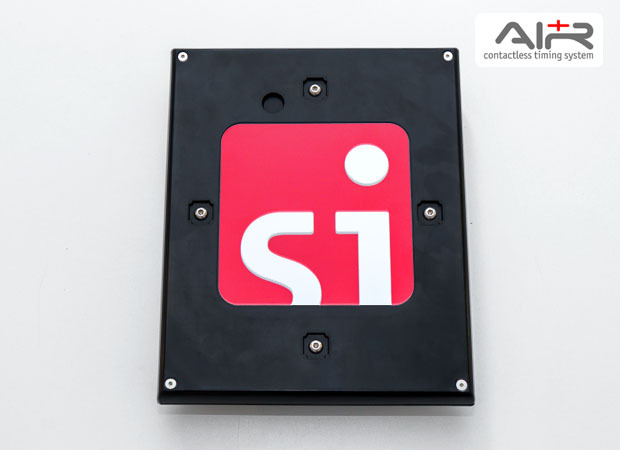 This SI-Card is an advanced passive punching card for orienteering and outdoor sports which features high punching speed and bigger data storage. 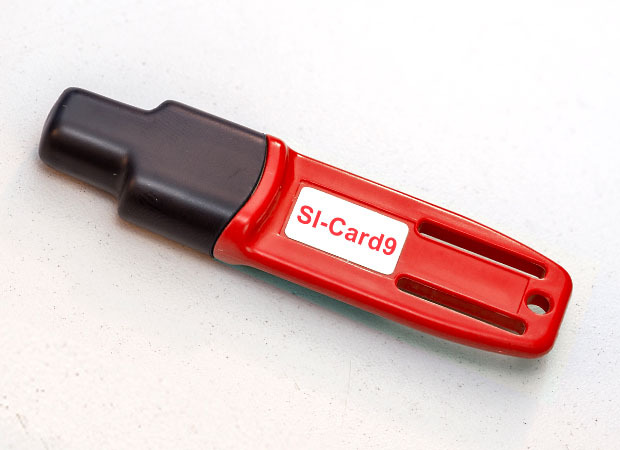 SI-Card9 comes in vary-coloured tips and bodies which is possible to be customized. SI-Card8 belongs to the second generation of SI-Cards. Providing new and exciting features the SI-Card is more attractive for outdoor sport activities. The advanced passive punching card for orienteering and outdoor sports features high punching speed and bigger data storage. 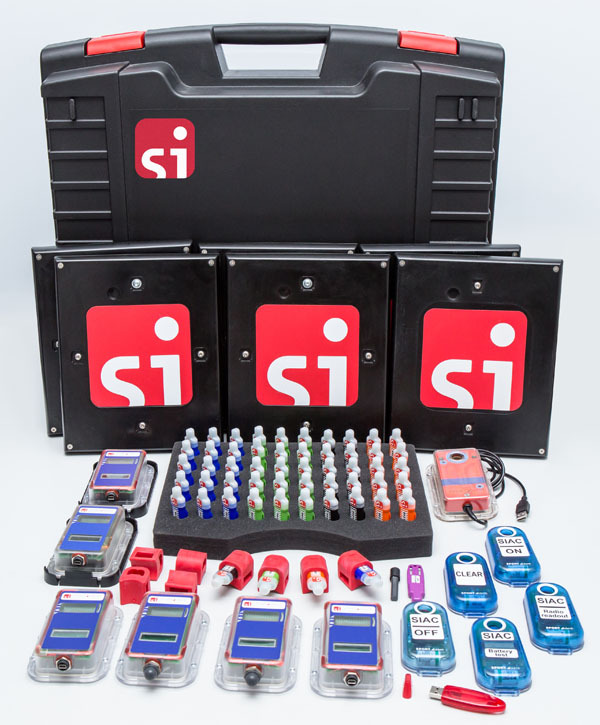 The SI-Card8 is available in two body colors, red and blue. The SPORTident pCard is an economical solution for outdoor sport events and is fully compatible with the SPORTident classic system. Compared to other SI-Cards, the pCard uses a different form factor and stores only up to 20 punches. Similar to other SI-Cards, the owner's name, club, email and so on can be stored in the card. In addition, the SPORTident pCard can be customised with a full colour imprint on both sides, e.g. with the logo of the organiser or of sponsors. 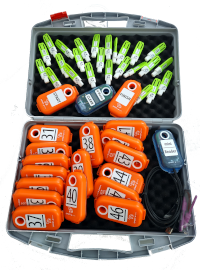 Identification at check points in outdoor sport disciplines like MTB Enduro, trail running, orienteering and MTBO is slightly different than in foot orienteering. In general, passing speed is higher and control points are more line elements than filigree objects. The BS11-BS small is specially adapted for these applications by enabling identification over the air. 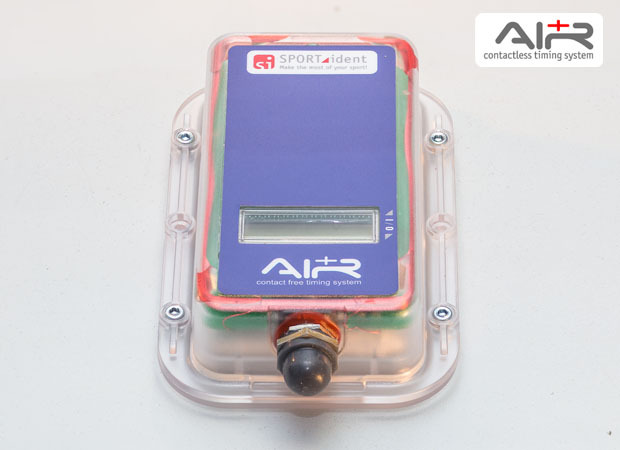 The station is part of SPORTident AIR+ system configuration and can be configured with SPORTident Config+. The unique design of the BS11-BL large meets requirements for identification at checkpoints in sports like skiing and biking. 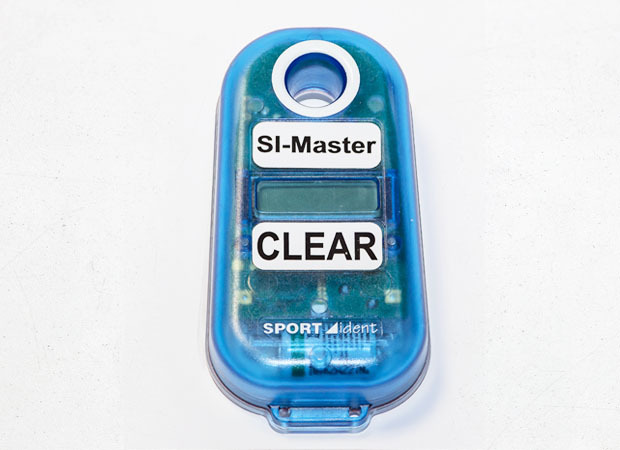 The SPORTident ActiveCard (SIAC) can register the intermediate and finish times in a range up to 3 meters. The SPORTident Station BS11-BL large features a new body with an increased RFID output. The station can be controlled and also be charged by USB interface. 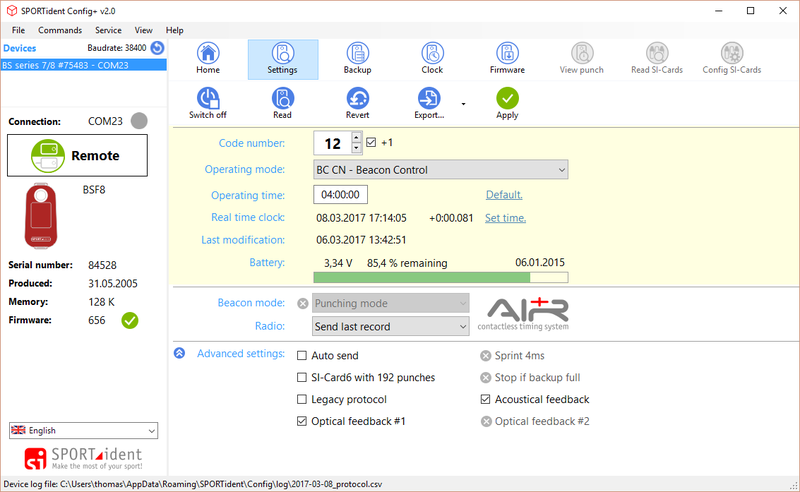 In Beacon mode, the data record about the passed control stations will be saved in more than one SIAC at the same time. The number of SIACs can be registered simultaneous is unlimited. The BS11-BL large can be configured with the software SI-Config+. Application Skiing, Bikiing, MTB Enduro etc. The BS11-Loop is developed for width areas, where the 3 meters range of a BS11-BL are not enough. The station comes with a ground antenna, which is plugged in the SI-Station. 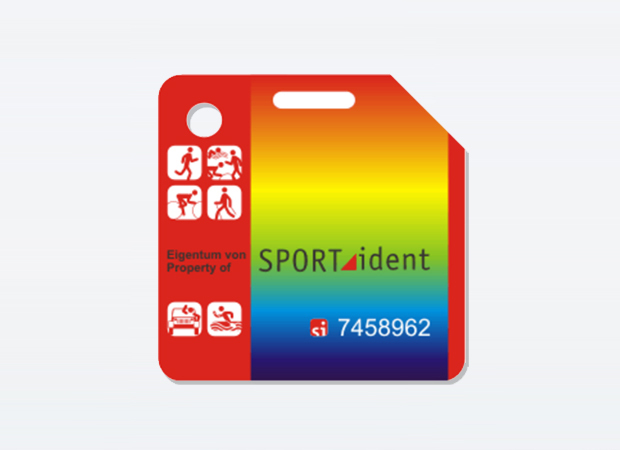 The SPORTident ActiveCard (SIAC) can register the start, intermediate and finish times in a range up to 6 meters. The station can be controlled and also be charged by USB interface. The number of SIACs can be registered simultaneous is unlimited. The BS11-Loop large can be configured with the software SI-Config+. The SI-Station only works in combination with the ground antenna. Application Orienteering, Trail, MTB Enduro etc. The SPORTident Station BSF8 is based on a newly developed hardware core. The BSF8 design offers a number of significant improvements with lower power consumption and new features compared with the older series of SPORTident Stations. It becomes more easy to configure since the BSF8 station has top/bottom display and is still compatible with the already existing SPORTident- System equipments. Additionally, the new BSF8 is also available with short range radio (SRR) which enables wireless transmission of SPORTident data records over distances of up to 8 metres. The radios are working in the licence-free 2.4 GHz radio-band and can be used worldwide. SRR creates a wireless data bridge to a receiver or repeater mounted some metres away by using SRR dongle. SRR dongle receives data records sent from BSF8-SRR and SIAC. The device features an USB interface for easy connection with PC, laptop or other standard communication equipment. SPORTident BSF8 Master is an extended SPORTident Station. It works and can be configured like any other SPORTident Station. In addition, two new service modes are implemented: "TimeMaster" and "ExtendedMaster". In operating mode “TimeMaster” the station transmits its clock time to any other SPORTident Station inductive coupled to the SI-Master. So a set of SPORTident Stations can be synchronised very quickly. Also in “ExtendedMaster” mode the SI-Master transmits its clock time to any other SPORTident Station. Additionally, the SI-Master clears the backup memory of the slaved station and transmits its own active time to any other unit. The SPORTident Station BSM8-USB is based on the BSM7-USB hardware core. The station works and can be configured like other SPORTident Stations. For environmental reasons the station has no internal battery, the power will be provided from the USB port. The new design offers a number of significant improvements and new features compared with the older series of SPORTident Stations. The new BSM8-USB Station is compatible with the already existing SPORTident System and can be used mixed with older equipment. SPORTident Center powers the Orienteering App’s online functionality and advanced features. The modern web platform excels at delivering beautiful online results instantly to your phone. With Center, manage your timed club trainings and results in one single place on the web. The O-Starter Set is a specially prepared Set of SI-Stations, SI-Cards and more than 1000 exercises. Along with the exercises you get the evaluation files, which are usable with the software EasyGec. The special orange SI-Stations are simplified in comparision to the common BSF8-Stations. They send only the control number to the SI-Card. O-Starter Sets are available in three different options: Set 4x4, Set 5x5 or Set 6x6. Additionally you can order supporting packs with useful accessories and you can upgrade your sets at any time. 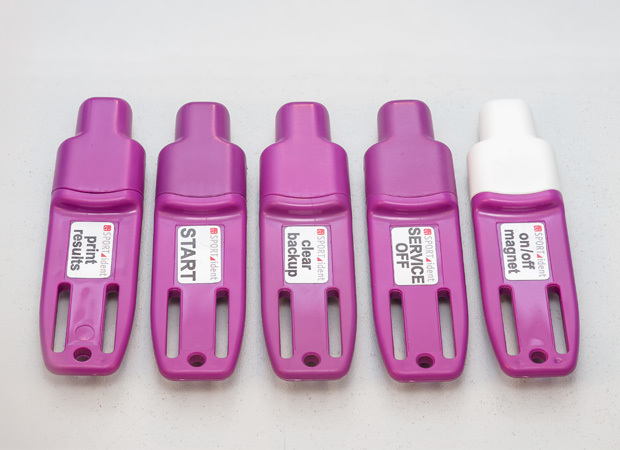 With our O-Starter Set you can quickly set up different exercises like learning games, relays and other team competitions, or simple orienteering events. All these exercises can be used at schools, universities, companies or sport clubs. The system is simple to handle and is a lot of fun for the participants. This set is useful for those who want to set up an event very easy and quickly. It is a good introduction to orienteering. We deliver all the needed equipment in a suitable transportation case. 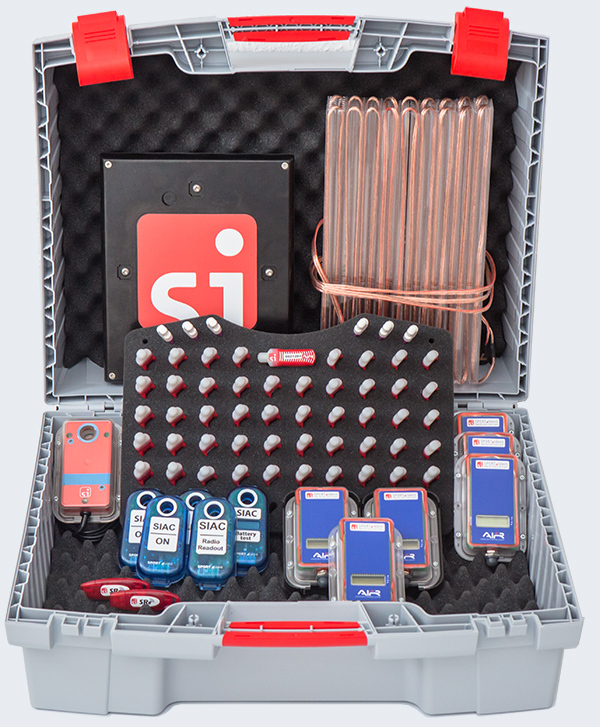 Feel free to contact us and together we will find the perfect O-Starter Set for you and your participants. The SPORTident MTB Enduro Set is a fully featured AIR+ configuration of SI-ActiveCards (SIAC), SI-Stations and more needful accessories. It is available in three different options: S, M and L. SPORTident AIR+ designates system features for contactless identification and timekeeping in extension of the classic system. All needed equipment (for 4-6 Stages) for timekeeping is available in a complete set, delivered in a suitable transportation case. SPORTident guarantees an easy and rapid installation even in areas where access is difficult. With the set you get many possibilities of evaluating and showing the data (e.g. live results at the course, Internet). With the MTB Enduro Set we provide you a complete solution for your MTB Enduro event. Feel free to contact us and together we will find the perfect size of your MTB Enduro Set - an experience for you and your riders. The SPORTident Trail Running Set is a fully featured AIR+ configuration of SI-ActiveCards (SIAC), SI-Stations and needful equpiment to run your event successfully. It is available in three different options: S, M and L. From option to option, the size of your set varies, to offer you a solution suitable for the size of your event. 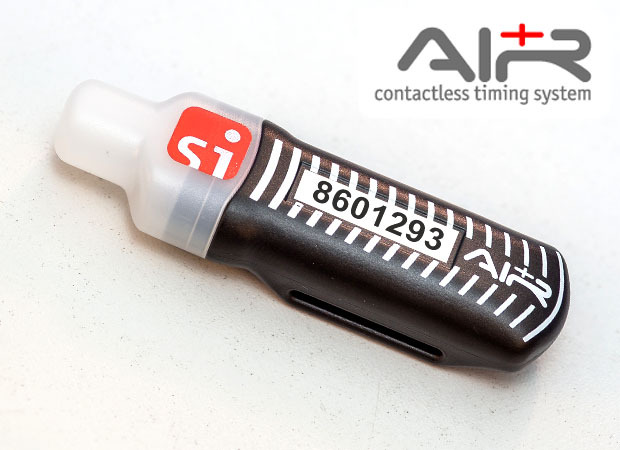 SPORTident AIR+ designates system features for contactless identification and timekeeping. All needed equipment (up to 8 intermediate times) for timekeeping is available in a complete set, delivered in a suitable transportation case. SPORTident guarantees an easy and rapid installation even in areas where access is difficult. With the Set you get many possibilities of evaluating and showing the data (e.g. live results at the course, on the Internet). By buying the Trail Running Set you will have a complete solution for your individual Trail event. Together we will find the perfect size of your set - to create a stunning experience for you and your runners. 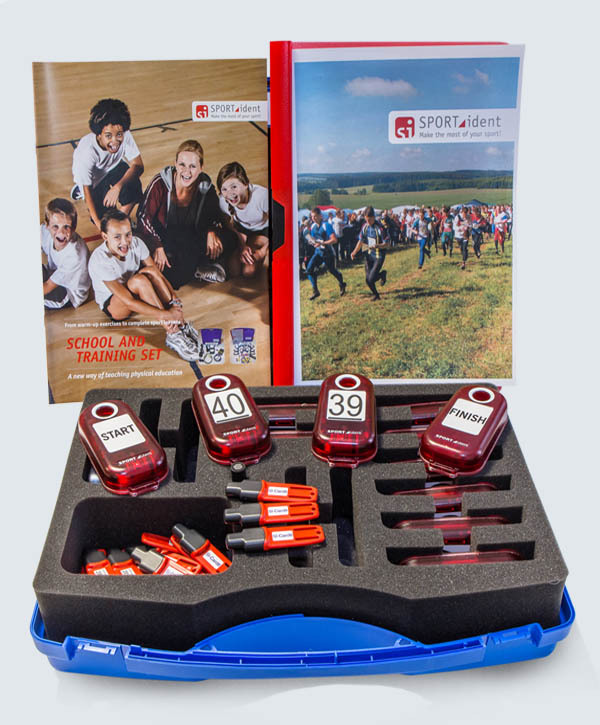 The SPORTident School and Training Set is a fully featured configuration of SI-Cards, SI-Stations and a thermal-printer. It enables the immediate usage of the SPORTident System without a PC. This instruction describes the handling of the SPORTident System for use at training activities and for sport lessons. Besides the priority use for orienteering, there exists a multitude of further possibilities where a personal timing at several control points is necessary. However, on principle the single working steps are valid for all variants of using the SPORTident System. The SPORTident devices as part of the School and Training Set are completely compatible with the whole SPORTident System. More information about the different system parts are given in the specific product release notes. Supplements USB-Converter, Mounting holder, etc. The SPORTident Printout Set is a complete and compact evaluation tool to read out and print the data stored in SPORTident Cards. It consists of the SPORTident Printout Station and a thermal-printer. Using the Printout Set the data records, stored in SPORTident Cards, can be computed and printed out. Standard features of the printout are control points' code numbers, punching times, lap times and total running time. The whole configuration is battery-driven, no PC is required. 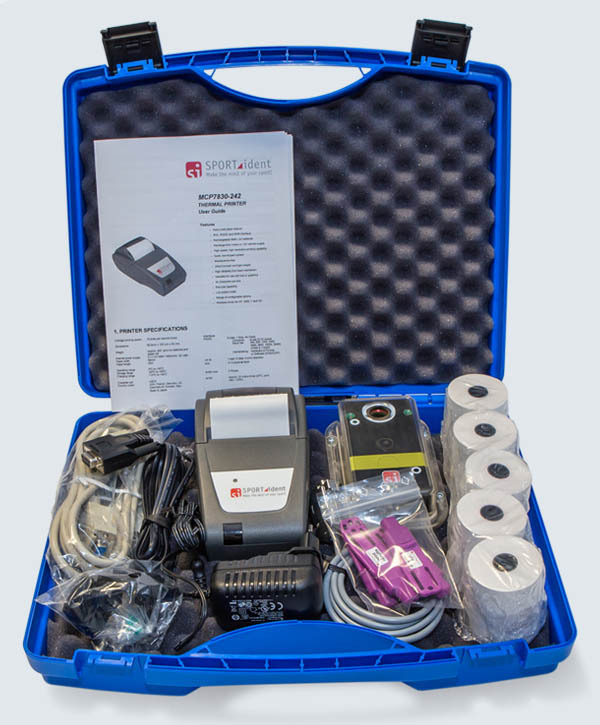 The Printout Set is a part of the School and Training Set, but we also offer Thermal-printer Set and BS7-P Printout Station separately. 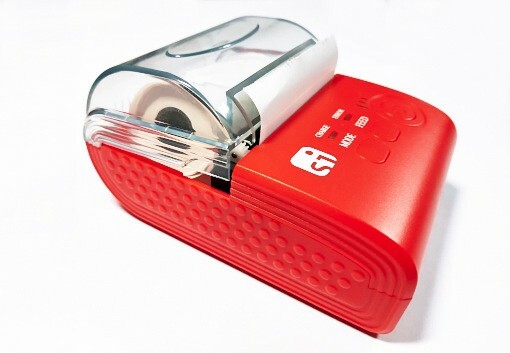 SPORTident Printer is a smal, lightweight and robustworks thermal printer. 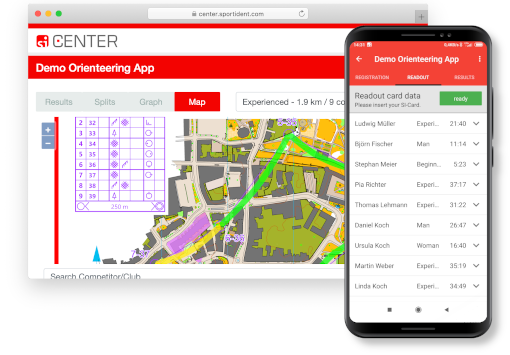 It works perfectly with smartphones or tablets and with the SPORTident Orienteering App. 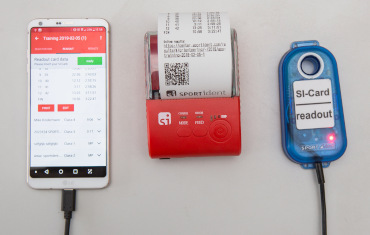 It is linked to the smartphone via Bluetooth and prints split times and overall results generated by the app. 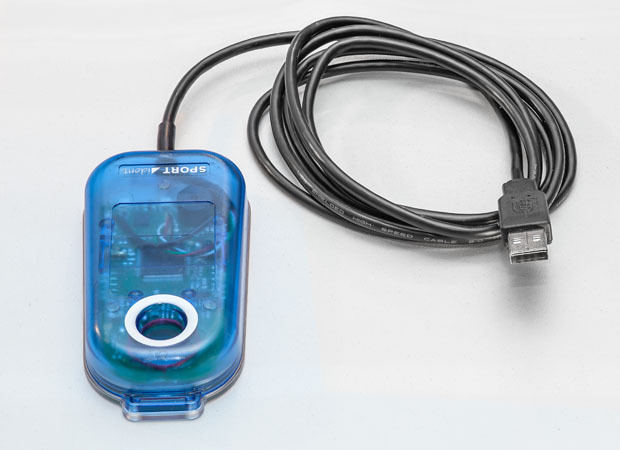 The SRR USB Dongle receives data records sent from BSF8-SRR or SIAC. The device features an USB interface for easy connection with PC, laptop or other standard communication equipment. 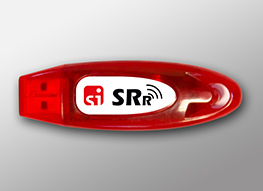 With the SRR USB Dongle organizers can transmit the data contactless by radio during or after the race. Intermediate times or live times can be easily realized. This RSSI is used to control and define the signal fields to avoid interferences with other magnetic fields, p.e. within transition area/ changing area of Relay races. 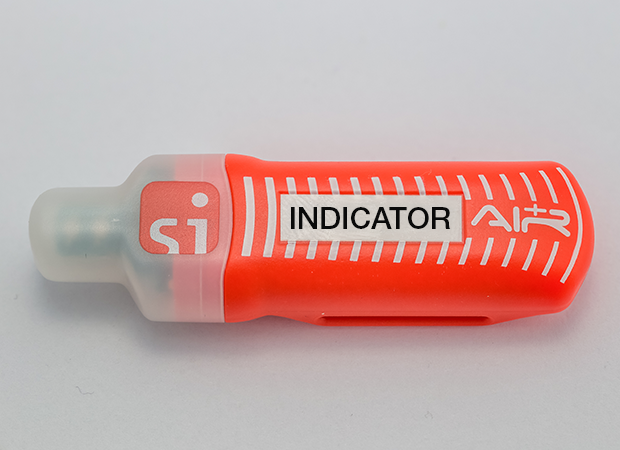 The SPORTident AIR+ signal indicator is an innovative feature for organisers of running events and clubs, used to measure the real magnetic field. Using SPORTident Cards either in sport competitions or training, the athlete should attach it on the finger, hand or arm with an elastic band. 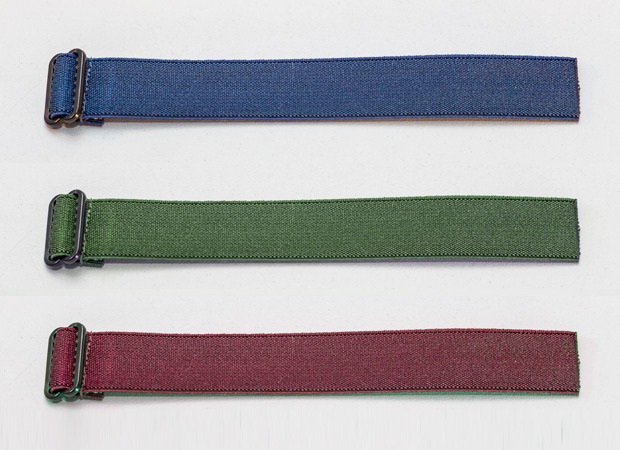 The elastic band is available in 5 different colors; black, red, green, blue and black-red. The size can be customised to adjust the needs. Mounting holder plate developed for SPORTident control station BS8, BS7 and BS11. The mounting holder is available in two sizes, small and large, for the different types of stations. 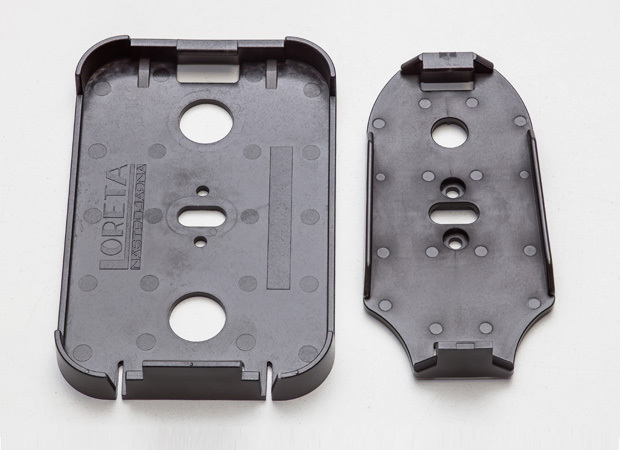 The holders will be delivered with mouting material and screws. Mounting holder "plate" for BS8 fixed on the base and a fiberglass stick 80cm. You get a set of SPORTident approved fixing plates to click in BS7/8 combined with a lightly flexible fiberglass stick of 80cm. The product was developed especially for schools and training lessons, because it is easy to set up in different terrains and comfortable to transport. Control flags are used for orienteering activities as a sign at the control point in the field. They are available in three different sizes: 30x30 cm², 15x15 cm², 6x6 cm². All control flags are IOF approved with the SPORTident icon on the top of the right corner. SPORTident's latest transportation case is be available in one size. 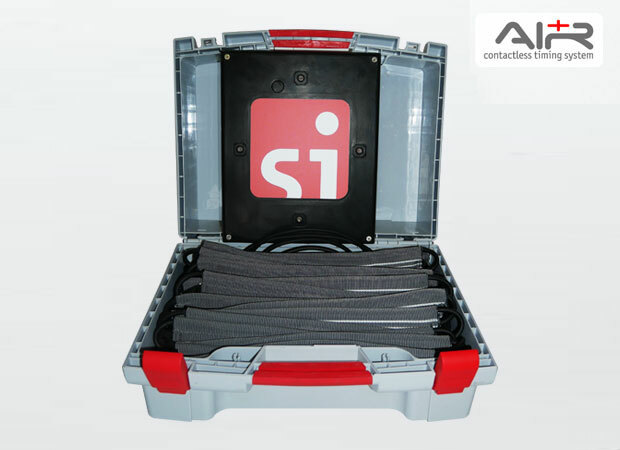 For individual settings you can choose between three different inserts: One for 60 SI-Cards, one for 18 BSF8 stations and one especially for the School and Training Set. The transport case grey-S designed has a size of 391 x 304 x 104mm. Feel free to contact us for more information. The carrying vest is the perfect solution to transport your SPORTident control stations to the controls. The vest with a standart camouflage design is available in two versions for BS7 and BS8 stations. Version A is a vest for 20 BS8 and Version B for 16 BS7 or BS11 BS. This PC software enables you to manage your whole SPORTident equipment. SPORTident Config+ will combine the features and functionality of Config, Boot (firmware update) and Personal (personalize SI-Card) and take you to a new level of productivity when preparing your SPORTident equipment for the next event or training. Standard users should load and install the normal setup version. Portable version is designed to work from memory stick/card (but also works from any directory on your local disk) and does not leave any trace on the computer. Please be aware that you still need .NET Framework installed on the computer and the application should have write access to its directory. Hints for users of Windows XP: The installer does not run on Windows XP anymore. However, Config+ still does with the only limitation of not being able to automatically check for program and firmware updates. Please use the portable version on Windows XP machines to stay up to date with the application and the firmware package. Alternatively you can prepare an updated folder of Config+ and the latest firmware package on a later Windows operating system and copy the folder to your Windows XP machine. In addition, please consider to abdicate Windows XP and use a more recent Windows operating system. 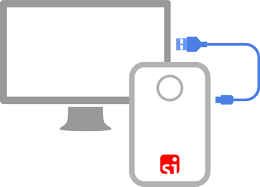 SPORTident USB driver for BSM7/8 USB stations and RS232-USB-Converter. New generation of BS11-BS/-BL with HID interface do not require this driver. The driver supports 32bit as well as 64bit Windows versions. Please extract the driver completely before running the setup. 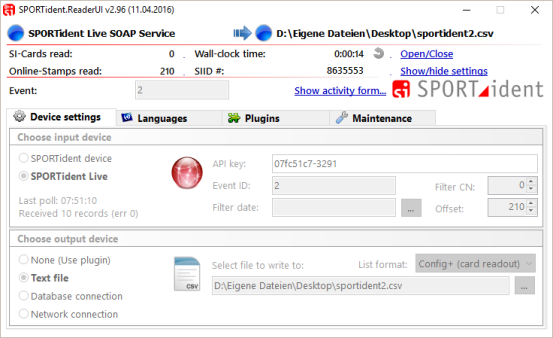 This PC software enables you to read any kind of SPORTident card with SPORTident base stations and writes the records to text files, database, network connection and more. Documentation and samples are included in the setup. 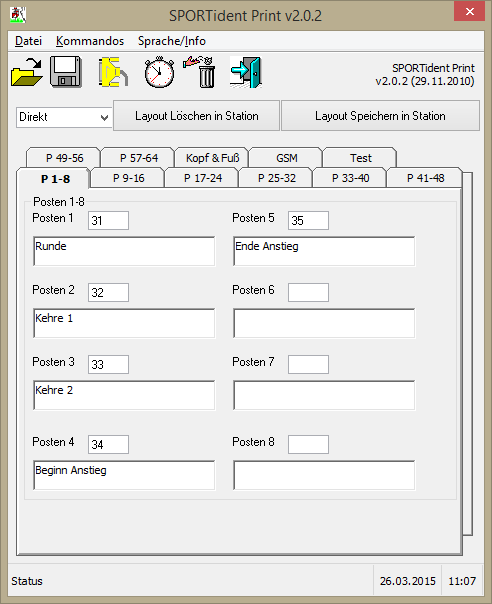 This PC software enables you to configure the printout layout for your SPORTident Printout station BS7-P. 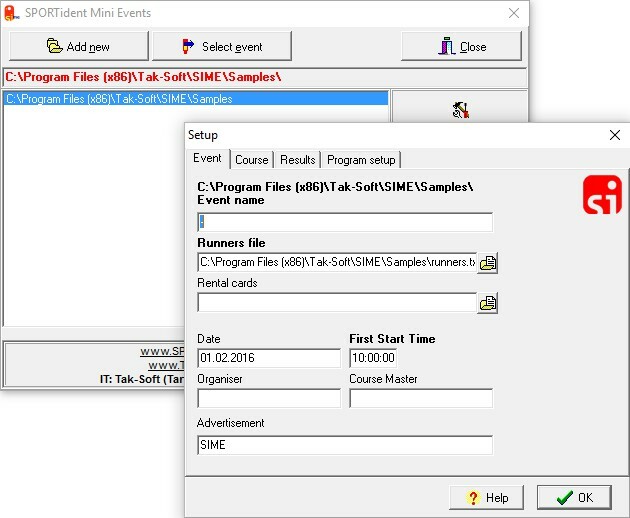 Basic event software for SPORTident school and training set. Buy your own SPORTident equipment and enjoy your sport even more, because timing and identification will be very easy and accurate. We offer flexible solutions and equipment for almost any use case and scenario you can think of, from small trainings up to competitions with several thousand participants. With your own equipment you are always flexible and self-sufficient, you can create, carry out and elegantly evaluate any training and competition. To make it easier for you to buy and use the equipment, we have set up a network of retailers and shops. There you can buy our products and get advice in your local language. All retailers are specially trained by us. Of course, you can also buy directly from SPORTident. If you want to order unique SI-Cards for yourself and your friends, please use our card reservation page. There you can configure a personal SI-Card according to your wishes (colors, SI number). 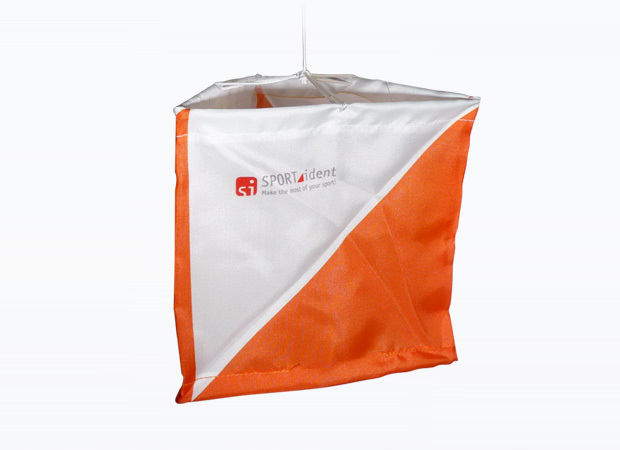 In addition to hardware, SPORTident also offers together with the orienteering app various cloud and online services. They ensure convenient result display and distribution. SPORTident manages these services directly. Whether you are an athlete or a sports organiser using our timing system, we will be happy to advise you. In dialogue we will find the perfect solution for your task. If you would like to try out our technology first or if you don’t have all the equipment for every single race in stock, we will give you the possibility to hire it.